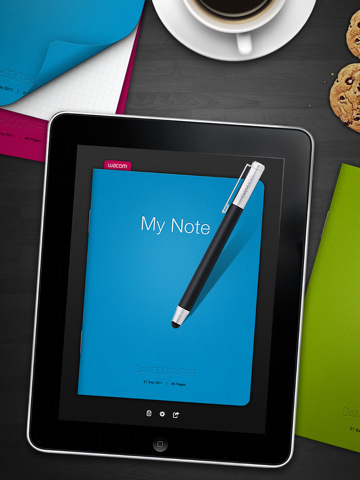 Bamboo Paper is a new iPad app from Wacom that lets you write using your stylus or fingertips with a very fluid response. You can create new pages in the provided notebook, but you can’t create multiple books. Settings in the app let you modify the cover’s color, give the notebook a name, and the paper type form blank, lined, or graph paper. It’s a really great iPad app for drawing, taking notes or just about anything else you feel like doodling. Navigation is done using the lower bottom part of the page, or tap it to see a visual page thumbnail picker. You can zoom in and out of the paper and pan around with two fingers. Tap and hold the screen to see the context menu where you can edit he brush thickness (3 choices) and brush color (6 colors). If you’ve used Penultimate before, you’ll be surprised to find out how smooth and fluid Bamboo Paper works. The only drawback as of now is the lack of ability to make new notebooks, although it looks like it might be coming soon. Right now the notebook only works in portrait mode, so let’s hope Wacom adds landscape support in the next version. Bamboo Paper also lets you email a PDF of the book to anyone which is really cool. Great little free iPad app for writing, so pick it up and see what you think. Oh and you might want to take a look at the Bamboo Stylus which Wacom so happens to sell for $29.95 to along with the Bamboo Paper app. 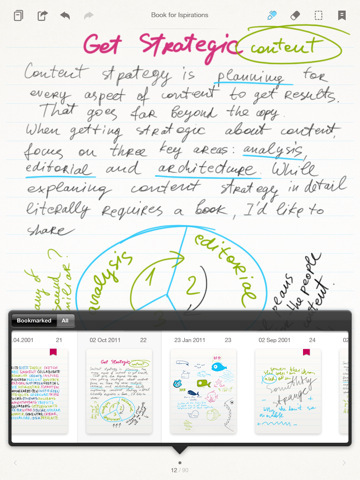 AppSafari review of Bamboo Paper – Wacom notes for stylus was written by Joe Seifi on June 17th, 2011 and categorized under App Store, Featured, Free, iPad apps, Notes, Productivity. Page viewed 6895 times, 2 so far today. Need help on using these apps? Please read the Help Page.